Jews were barred from living in Šamorín until the nineteenth century. Instead, they resided in nearby Mliečno and commuted to Šamorín for business. They gradually moved to Šamorín after an organized Jewish community was established here in the 1860s. In 1912, the Jewish community built a new synagogue on the eastern outskirts of town. The Šamorín community had 318 members in 1930 but was devastated during the Holocaust. No Jews live in Šamorín today. 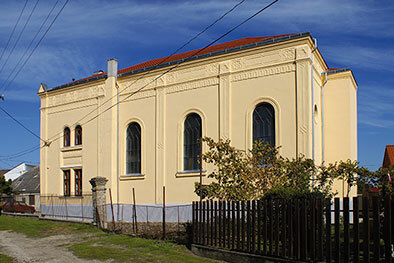 Šamorín's former synagogue stands at the heart of a traditional architectural setting that also comprises a former Jewish school and other Jewish communal buildings. The Jewish cemetery is located nearby. The synagogue, a rather small building with a simple façade, was spared twice from destruction. The German army, which used the building as an ammunition dump, wanted to destroy it when it retreated from town in 1945 – but did not do so. Then, in the 1990s, after the building had stood neglected for decades, Csaba and Suzanne Kiss stepped in and saved it from demolition. They restored the synagogue as a precious historical site, conserving evidence of the damage it had suffered, and established there the At Home Gallery, a center for contemporary art and cultural dialogue that attracts artists, musicians and other figures from around the world. In 2000, the Dalai Lama visited the synagogue during an exhibition by Tibetan monks. Hours: Wednesday–Sunday 14:00-18:00. Groups and special visits can be arranged in advance.